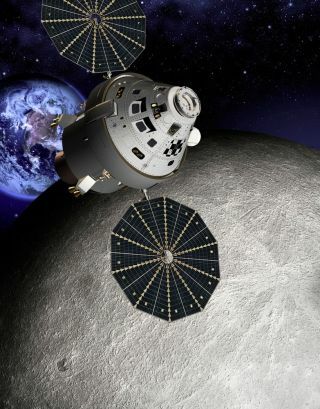 This artist's conception shows an Orion capsule at the L2 point on the farside of the moon. The 12-person blue-ribbon study group observed that the White House should take the lead in forging "a new consensus" on NASA's future in order to more closely align the agency’s budget and objectives and remove restrictions impeding NASA's efficient operations. While the NRC study team did not undertake a technical assessment of the feasibility of an asteroid mission, it was informed by several briefers and sources that the current planned asteroid mission has significant shortcomings. "A current stated interim goal of NASA's human spaceflight program is to visit an asteroid by 2025," said Albert Carnesale, chancellor emeritus and professor at the University of California, Los Angeles, who chaired the NRC committee that wrote the report. The NRC report added that there appears to be continued enthusiasm for a mission to the moon but not for an asteroid mission, although there is both U.S. and international interest in robotic missions to asteroids. But the view that a manned flight to a near-Earth object (NEO) is a dubious destination doesn’t settle well in some quarters. "I agree with the findings in the NRC report that NASA has a long way to go to fulfill the Obama goal of an asteroid mission by 2025," said former astronaut Tom Jones, author of the upcoming book, "Mission: Asteroid." Jones told SPACE.com that NASA has not taken any major steps, starting with a search for near-Earth asteroid (NEA) targets, necessary to achieve that goal. The agency has so little money that it can’t afford its own asteroid search program, relying instead on a private asteroid-hunting telescope commissioned by the B612 Foundation. NASA's Orion deep-space vehicle and large booster programs won't fly with a crew until after 2020, given current budgets and schedules, he said. "The best way for NASA to reach both its asteroid goal and to launch humans into translunarspace — beyond the moon — is to use a robot spacecraft to retrieve and return to a safe lunar orbit a small, 500-ton asteroid," Jones said. "Near the Earth-moon L2 point, astronauts and robot probes can explore and dissect this asteroid for science and commercial-scale resources … water being the most valuable." Bringing the asteroid to the astronauts, Jones said — as described by the Keck Institute for Space Studies team in 2012 — "could jump-start an entire industry between the Earth and the moon, using the energy and raw materials of space to enable everything from robotic probes to the planets, to eventual moon and Mars surface exploration," he said. "U.S. strategic goals for human space activity need to be long-term. We should have continuous operational reach in near-Earth space, regular access to the surface of the moon, and regular access to Mars," said Mark Sykes, director of the Planetary Science Institute in Tucson, Ariz. He is also the chair of NASA’s Small Bodies Assessment Group. "All of this requires building space-based infrastructure on a foundation of self-sustainability. Accessing and utilizing resources available on near-Earth objects, particularly water for fuel, life-support and shielding, is the cornerstone and is critical to achieving any of these goals," Sykes told SPACE.com. Sykes said it would make sense to send a piloted mission to oversee the automated emplacement and startup of a resource recovery facility on a near-Earth object. "This could help guarantee the successful deployment of many untended facilities to other targets in the future by bringing what humans do best: dealing with the unexpected and improvisation," Sykes said. "In the meantime, great science could also be achieved, but this is strictly bonus…not a rationale." This could be done on the timescale envisioned by President Obama, Sykes said, with some initiative and little additional cost, and far less total cost than any other option. Existing Discovery mission proposals are on the table to fly a Wide-field Infrared Survey Explorer-class spacecraft that would identify many NEO resource targets in orbits that would afford low-energy, short-duration missions, Sykes said. Additionally, resource recovery experiments could be undertaken on the International Space Station using meteorite samples and other analog materials, Sykes said. "Apollo taught us that doing something once or even a few times is no guarantee that it will ever be done again. If we want a permanent American presence in space, we need to learn to live off the land," Sykes said. "Near-Earth objects are our best opportunity to accomplish this cost-effectively," he concluded. There's no lack of asteroids to focus upon, said Lindley Johnson, NEO Observations Program Executive at NASA Headquarters in Washington, D.C.
Johnson noted that he doesn’t speak for NASA's Human Exploration and Operations Mission Directorate (HEOMD) and not in a position to be able to say anything about the priorities for piloted/human spaceflight missions. "I just know HEOMD has a great challenge to be able to build the basic capabilities needed for future human spaceflight with the budget prospects they’ve been given," Johnson told SPACE.com. "But we also know there are a lot of near-Earth asteroids out there between here and Mars and we still see them on the horizon for the future of exploration. Maybe somewhat beyond this next hill we must climb, but they are still out there for us to reach for," Johnson said.